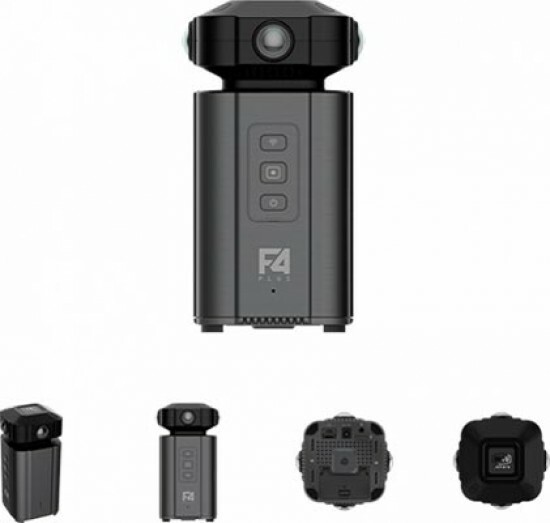 360° camera pioneer Detu has launched the F4 Plus an 8K Virtual Reality Panoramic Camera. Designed for professional photographers and VR content creators, the Detu F4 Plus features four multi-layered 200° fisheye lenses, and records 360° videos at a resolution of 7,680x3,840 pixels and a frame rate of 30 frames per second. Engineered to enable users to livestream with ease, the camera can connect to a computer via an Ethernet cable, or wireless live streaming is possible over 2.4G and 5G dual frequency Wi-Fi. The removable 4800mAh lithium-ion battery supports up to 120 minutes of continuous shooting. The F4 Plus carries an MSRP of $2599 and will be available on Amazon. Detu launches the F4 Plus today, a professional grade 8K virtual reality (VR) panoramic camera, which can capture 360° images, videos and livestream (wired and wireless) with perfect clarity. The sleek, high-performance camera specifically designed for professional photographers and VR content creators can shoot 360° images and videos with incredible 8K resolution (7680 x 3840, 7680 x 3840 @30fps)*. The F4 Plus features four 200° fisheye lenses, which have eight layers specifically to help minimize distortion and glare. The camera stitches the images from each lens together into a seamless 360° view using the DetuStitch software. The optical flow algorithm is suitable for dynamic stitching of images in case of image motion, and fast stitching means that 4K video generated and stitched by the NVIDIA GTX 970 high performance graphics card can reach an impressive 20fps (frames per second). Engineered to enable users to livestream with ease, the camera can connect to a computer via an Ethernet cable, or wireless live streaming is possible over 2.4G and 5G dual frequency Wi-Fi. It can livestream to YouTube, Facebook and other 360° enabled platforms. The F4 Plus has a copper and aluminum frame, which helps to dissipate heat, a common issue when live streaming in high resolution. This, along with its air duct and cooling system significantly enhances the battery life and equipment stabilization. The 4800mAh lithium-ion high capacity removable battery supports up to 120 minutes of continuous shooting. In addition, through a charging base, it can charge two batteries simultaneously, which serves as highly useful to professional photographers and VR content creators on set for sustained periods of time. Ideal for professional users who create a high volume of content, the F4 Plus provides a powerful camera, with a maximum Micro SD card storage capacity of 128 gigabytes. Designed to capture beautiful images as well as sounds, the camera also supports audio with two built-in microphones. With only three buttons on the outside shell, it is elegant and straightforward to use. Designed to work with dedicated iOS and Android apps, users can easily control the camera, as well as edit and share images on social media. It also provides a real-time preview of panoramic images. DetuStich stitches the images together, DetuLive livestreams and DetuPlay showcases images and videos for VR. The F4 Plus has been designed to give professional photographers and VR content creators a pioneering piece of technology to bring their images and videos to life. The F4 Plus has an RRP of $2599 and will be available on Amazon. *If livestreaming and recording data at the same time at a resolution of 2K in each lens, the DetuStich app will transform the content into 4K video. If the camera is recording video with 4K in each lens, the DetuStich app can be used to generate 8K resolution.